A few nights ago, I had received an invitation from BlogHer to participate in one of their new campaigns. I have participated in many BlogHer campaigns in the past – however this particular one is quite unique. 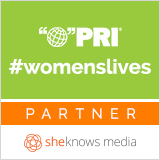 The reason this one is different from many of the others I have been involved in is because Public Radio International (PRI) and SheKnows Media joined together through this BlogHer campaign to help create further awareness of struggles that women and girls around the world face on a constant basis. I was extremely honoured to receive this invitation. However, the first thing I thought was hmm I am not sure if I am really the right fit for this campaign after I had read it through. I am not really what you would consider to be a die hard feminist, however, the more I thought about it- I realized that a huge portion of the struggles that women and girls face around the world go beyond gender inequity. Then that is when it hit me! I am more than just a mom, a mother of a child with special needs, and a wife who takes care of the home. I a woman! And my role is to help empower other women, and encourage them to use their voices and to be heard. My daughter is a teenager, and soon enough she will become a woman. The only way she will take on the role of empowering other women as well is if she sees me do just that. The kind of awareness that is needed to bring out the realities of what women face will need to be ongoing for a long time. Those who are participating in this campaign will be blasting out stories from their blogs, as well as through social media with the hashtag #WomensLives. We would appreciate it if you happen to see our posts to also share it through out your networks. Our goal is to help empower women around the world- and we would love your help! Thank you and I’m excited to watch you do so! Thanks Lisa! I am so happy to be contributing to #womenslives.